Conference participants must register via webshop.nytud.hu. The registration fee is HUF 20,000 (approximately EUR 70.00/USD 80.00) for full-time employees. Students and unemployed researchers are entitled to a 50% reduction. You can book accommodation and order lunch for the conference days on the same site. The registration fee includes the conference folder, coffee breaks, snacks and the wine reception. The conferene takes place on the campus of Pázmány Péter Catholic University in Piliscsaba. Click here for a marked up googlemap indicating the airport, the bus stations and the campus. Take the airport bus no. 200E to the underground (in Hungarian: 'metro') station called Kőbánya Kispest (the ride takes about 20 minutes). You need to buy a single ticket at a vending machine (or at the post office or the newsagent Relay at the airport). A single ticket costs HUF 350. You can also buy a ticket at the bus driver (HUF 450). From here take the underground to Árpád híd underground station (line no. 3 in the direction of Újpest Központ, the ride takes about 25 minutes). You will need another single ticket. Take the underground exit to Árpád híd bus station, where you can take a direct bus to campus in the direction of the city of Esztergom (you should be able to find the bus at Bay 2.) 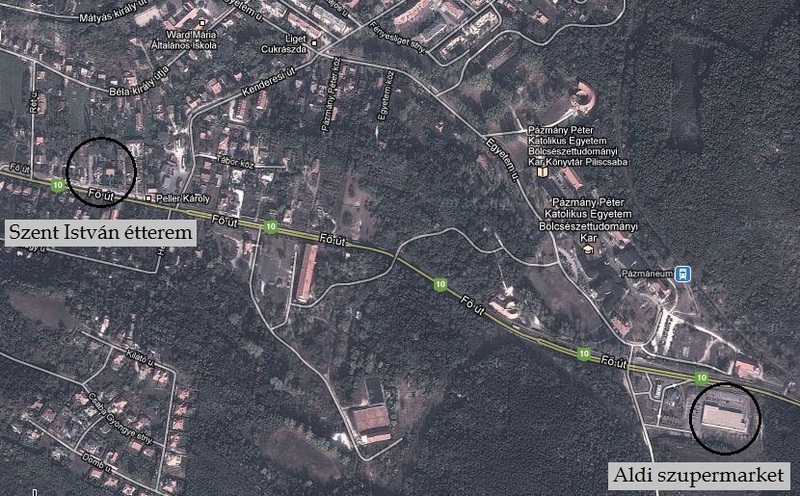 The bus stop where you need to get off is called Pázmány Péter Egyetem, the trip takes about 45 minutes. There are two kinds of buses that run between Árpád híd bus station and Pázmány Péter Egyetem. The regular VOLÁN bus no. 800 departs every 30 minutes in the direction of the city of Esztergom. Tickets for these buses are available at vending machines or in the bus ticket office in the station building. You can take either the regular VOLÁN bus or the replacement bus. Take the undergound (in Hungarian: 'metro') line no. 2 in the direction of Déli Pályaudvar (Southern Railway station). You need to change to undergound line no. 3 at Deák Ferenc tér (in the direction of Újpest Központ) and get off at Árpád híd. You only need one single ticket (HUF 350), and the whole trip takes 30 minutes. Take the undergound (in Hungarian: 'metro') line no. 3 to Árpád híd (in the direction of Újpest Központ), where you have a bus station. You need to buy a single ticket for the underground at a vending machine (HUF 350). Take the underground exit to Árpád híd bus station, where you can take a direct bus to campus in the direction of the city of Esztergom (you should be able to find the bus at Bay 2.) The bus stop where you need to get off is called Pázmány Péter Egyetem, the trip takes about 45 minutes. There is a cheap and relatively large supermarket right across the road from the main entrance of the campus, called ALDI. All major cards are accepted here. If you walk down the road towards the centre of Piliscsaba, there is a restaurant called "Szent Istvan" at ten minutes' walk. There is also a guesthouse next to this restaurant. We will be able to provide accommodation in double rooms in a decent dorm called „Iosephinum” on campus (single occupancy: 6800 HUF/night, shared occupacy: HUF 3400/night). Every two adjacent rooms have direct access to a common bathroom. There will be bed linen/sheets in your room, and you will receive a towel. your stay. If you want to use your laptop, you will need to bring a cable. At the conference venue itself (two minutes from the dorm), there is free wifi access. You can book your accommodation at webshop.nytud.hu. The currency of Hungary is called Forint (abbreviated in the international format as HUF). We suggest that you retrieve cash from an ATM with your card as soon as you arrive in Hungary. You can also safely exchange money at official exchange offices in the street, or at the train station, bus station or the airport. The ones at the airport are likely to be more expensive than those in the city. There are two places on campus where you can withdraw money from your account. Two ATMs, one in the building "Ambrosianum" and one at the main gate (see the campus map), as well as at the post office on campus located next to the building "Questura" (open from Monday to Friday 9am-5pm). You can exchange money at CIB Bank in Piliscsaba, the small town the campus is located at (Address: 1 Kinizsi Street, Piliscsaba, which is at the corner of Kinizsi and Bajcsy-Zsilinszky streets. Open: Monday-Thursday 8am-4pm, Friday 8am-3pm). 7. Conference lunches and food. For the conference days, we arrange a two-course lunch for HUF 1000 per day. If you choose to order, you can buy lunch in our webshop for each day separately. You can indicate dietary restrictions on the confirm page at the end of the payment process. Apart from the conference lunches, the amount you spend on food depends on too many things to give an estimate. However, we can give you some indicative prices here. Lunch in the cafeteria on campus: cca. 4-5 euros/day. A one-course dinner with a soft drink in the evening in a nearby restaurant: starting from 8 euros. One beer: about 2-2.50 euros. 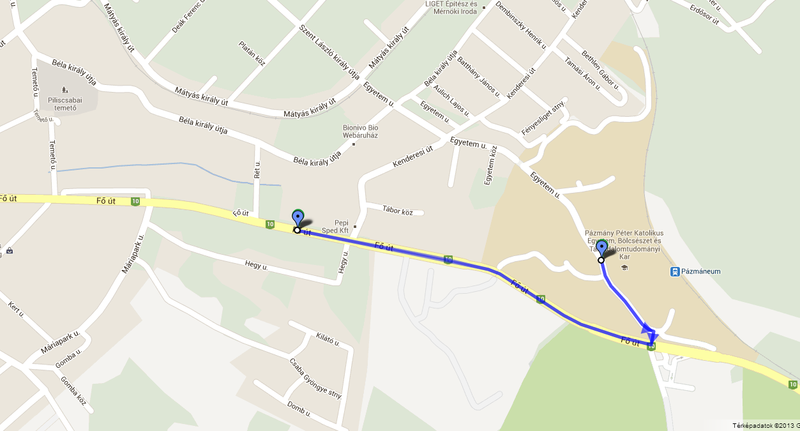 There is a cheap supermarket called ALDI across the road from the main entrance of the campus. Some printing and copying services are available at the University in the main building (Stephaneum) where the Conference is going to take place (cca. HUF 10 /page). Our student helper Lilla Pintér can be called in case you're in an emergency during your stay.